Kitchen water circuit design must consider the comprehensive, outlet, outlet, can be more than a few will not be wrong in advance, or afterwards when you want to add some kitchen equipment, you will find a small outlet, is simply the kitchen disaster. But the socket location as far as possible away from the water and stove, to prevent leakage accidents. Some home kitchen light is not very good, this time the kitchen lighting design is particularly important. Kitchen light preferred white, does not affect the color judgments. Washing, preparation, the local lighting console, so that the evening is not difficult to cook, to better grasp the cooking of the furnace. 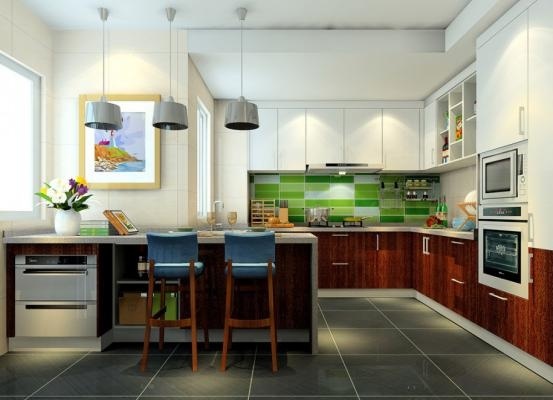 Kitchen space must make full use of, in the home improvement can be designed early cabinets furnishings. Even if the kitchen hood, but the smoke is also unavoidable, so to receive something to try to receive the cabinet or storage box. Youyanjiangcu these commonly used materials, but also into the cupboard, or pick up the bottle when the greasy touch, make you feel greatly reduced cooking. Kitchen is oil heavily, so do not choose wooden floor, you can try not to choose the dirty tiles. But if you are a cleanliness of patients, select the light tiles is also good, both can make the kitchen more bright, you can clean up the garbage in time to ensure that the kitchen clean and tidy. The use of fire-resistant heat-resistant ceiling materials, conditional on the light steel keel, pay attention to and uniform ceiling plate to buy the kitchen as far as possible not to have cracks. Will be directly connected to the ceiling cabinet, ceiling, due to condensation of water vapor or fumes easily. Ceiling is best not to be too high, not too low, too low easy to dirty, too high is not easy to clean. Cooking range hood closer the better, often do not cook for good-looking, then choose the European-style hood. European-style hood is indeed better than the Chinese-style fashion, but China's eating habits and Europe, or there are differences between the Well. Practical is the last word! If it is installed on the hood, smoking mouth and stove distance should be maintained at 75-85cm. Table is the main use of the kitchen area, too low will increase the burden of low back, calculate a reasonable height will improve the kitchen comfort, so that cooking easier and more comfortable.